This was my entry for Digital Tuesday Challenge #55 until I realised I'd looked at the wrong date and this challenge was for last week. I've linked it and everything and then realised it's Thursday and a new challenge has been blogged. Next time I will check the date before I spend all my time making a card. Anywhoo this is how I made the card. 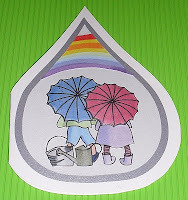 The raindrop card and mats were cut on my Craft Robo and I coloured an image from Stamp'en with CJ with my copic markers. Going to bed now as I've not slept for the last week while we waited to find out if my OH was going to be made redundant. Luckily he wasn't so big relief for us. It's a lovely card Poppet even if you missed the challenge, and I love how you thought to cut the mat in a raindrop, so cool! Thank you very much for your lovely comments, they are much appreciated.To be honest, I started my blog because of all the lovely people I've met in blog land. What a shame you missed the challenge, this is a beautiful card! Glad to hear OH's job is safe! Your card is fabulous Poppet, the teardrop shape is great and I love the sweet image.